Following on from the spread theme of last week, we examine recent developments in the seasonal gas price spread. This is a key driver of the value of a broad range of seasonal flexibility, but of specific relevance to gas storage assets. There are some opposing forces at work which are driving spread dynamics. A rise in import dependence has increased the importance of seasonal flexibility in the European gas market. Yet this import dependence has changed the dynamics of the underlying spread, making it more challenging to value and monetise seasonal flexibility and therefore to justify new investment. Spread fundamentals have been structurally altered by increasing levels of import dependence, given that declining domestic production and imports themselves offer alternative sources of flexibility in competition to gas storage. The table below summaries some key forms of supply side seasonal flexibility. Oil indexed pipeline supplies typically include ‘take or pay’ provisions that allow purchasers to reduce take by around 15-20% of the Annual Contract Quantity (ACQ). Flow incentives are driven by the relative levels of contract prices against hub prices. Depending on the relative tightness in the global LNG market, owners of flexible LNG cargoes may choose to profile European deliveries into the higher priced periods to a greater degree. At times it may make sense to profile remaining production from mature fields into higher priced periods if the seasonal premium offsets the opportunity cost of delaying production by extending the field’s life. The demand side can also have a significant influence on the summer/winter spread. This is particularly the case for gas demand from gas fired power plants. The relative marginal cost of gas fired generation relative to other thermal generation is a key driver of the level and seasonal shape of power sector gas demand. For example, if the marginal cost of gas fired generation switches from being lower than coal in the summer to higher than coal in the winter, this will act to flatten the seasonal profile of overall gas market demand putting downward pressure on the seasonal spread. The interaction between these supply and demand side dynamics creates the conditions for a more volatile seasonal spread, illustrated across the last three years in the chart below. Note: the definition of seasonal spread we have adopted here is the winter directly after the front summer season less the front summer season. Recent history provides an interesting example of the dynamics described above. 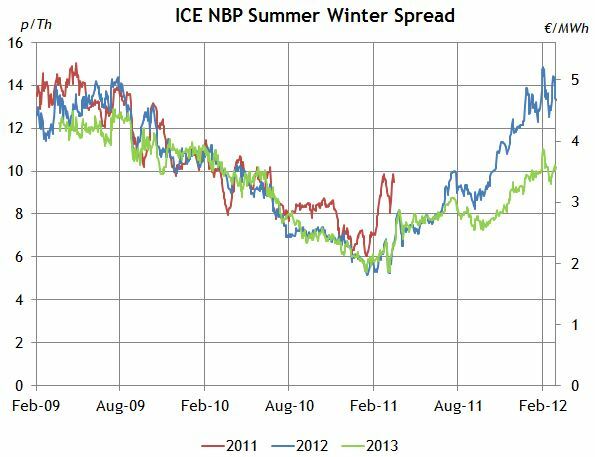 The winter/summer spread drifted lower from 2010 through to Q1 2011, as gas prices recovered in the wake of the financial crisis (with summer prices rising more than winter). The Fukushima nuclear disaster in early 2011 precipitated a sharp recovery in spreads as Japanese LNG demand surged, driving up Asian prices and reducing LNG imports as a source of flexibility into Europe. The spread recovery has also been driven by buyers minimising ‘take or pay’ contract deliveries as oil-indexed contract prices have been higher than hub prices. As a result there has been less flexibility to reduce flows in lower demand summer periods, increasing the seasonal spread. The description above focuses on prompt fundamentals. These are an important driver of movements in the forward summer spread, given the tendency for the forward curve to move in sympathy with spot (the “prompt wagging the curve”). However, the prompt/forward relationship has weakened somewhat in recent years, a sign of the gas market maturing given the increase in complexity of forward dynamics as a result of Europe’s increasing import dependence (e.g. divergence in the 2012 and 2013 spreads can be seen in the Chart 1). In order to understand the future evolution of seasonal spreads it is useful to take a step back and summarise the drivers. Table 2 sets out some key factors that have a bullish or bearish influence on the level of the winter/summer spread. Table 2: Characterisation of some key spread influences. Although it is possible to characterise these influences on the seasonal spread it has to be done with qualifications and conditions (if this then …, given x and y the incentives are …). This is a simple reflection of the broad range of spread influences and the fact that none of them are absolute or constant. The outturn seasonal spread will be a complex and dynamic function of the current status of these different drivers and how they interact. In favour of gas storage capacity is the fact that it is the only form of seasonal flexibility that can be guaranteed to be available (subject to outages and inventory levels). The challenge for storage developers is to understand what price signal these dynamic conditions provide for new capacity and how to value and monetise that capacity. In two weeks we will explore this challenge from the point of view of a storage project developer and put some numbers around the spread required to support investment.